The average tourist usually spends one morning or afternoon around Forlì. If they have extra time to spare, they might go as far as spending a whole day in the city. They will visit and photograph the main attractions of the city centre (Saffi Square and the Duomo), go for a walk down Corso della Repubblica, maybe visit the San Domenico Museums. Not much else. And yet, if one has the tiniest bit of spirit of adventure, and feels like taking some extra time for a walk, the city will reveal its most hidden and most beautiful spots. 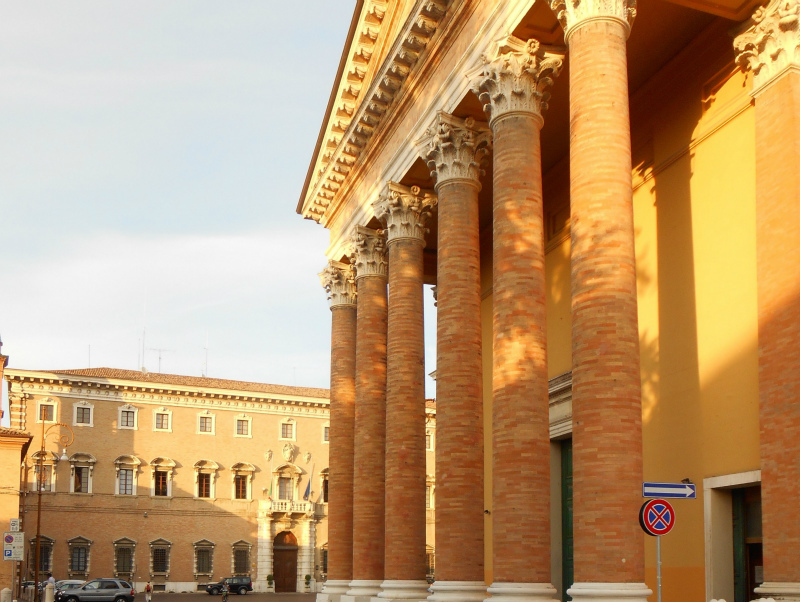 The ideal starting point for an Urban Safari around Forlì are the San Domenico Museums, unarguably a major cultural hub in Forlì and in the area. The museums, headquartered in a 13th-century Dominican convent, are especially known for their internationally renowned exhibitions, usually highly interesting and very well curated. Late at night the square is also home to the unmissable botellòn parties organised, mostly toward the end of the academic year, by the many students based in the city. The square is the perfect location for large music- and drinking-based meetups. It’s isolated enough to prevent those living in the houses nearby from protesting against the noise, but it’s super close to the city centre, which makes it very easy to get there. So you see, the Museums act as a 24/7 multi-purpose cultural hub. If you walk along the square, you will reach a mural street painted by artist Gomez on a building wall overlooking the square around a year ago. The mural is as large as those posters that envelop public buildings when they are being renovated. Except, this one is a permanent addition to the urban landscape and, despite repeated attempts at vandalising it, the local population happens to like it a lot. Take Cobelli Street, to name one; it starts from the Museums square. Go down Cobelli St. and you will find yourself in Garibaldi Square. Right to the left, you will see the Duomo and, right next to it, Ordelaffi Square. Some time during the day, especially when the sun sets, the warm, golden sunlight makes the brick walls of the Duomo and the Prefecture building even redder and brighter. To the left of the Prefecture you find Maroncelli Street. 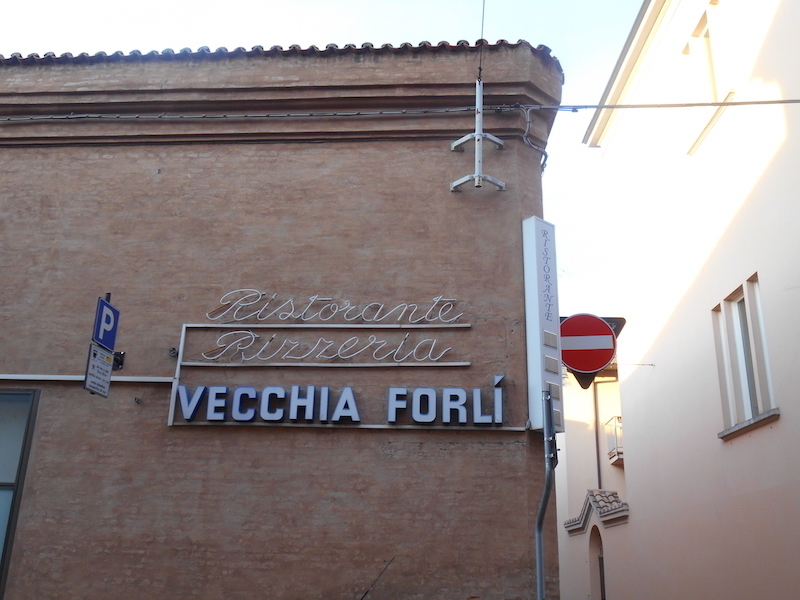 The Vecchia Forlì restaurant was just there. You can still see the sign hanging on the outside wall of the restaurant building. Now, walk on and turn right into Hercolani Street, which then changes into Dei Mille Street. A bit further on, to the right, that’s Paradiso Street, while at the end of Dei Mille St. you’re at a crossroads: little San Biagio square to the left and Dandolo Street to the right. 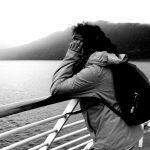 Most likely you’ll be thinking: ‘Wait a second, let me see what’s over there, behind that corner, and then I will go back’, but you will keep going instead, and walk back to the centre by a completely different route than you had initially planned. Yes, because though writing about it makes it sound like a thick bundle of streets, it is virtually impossible to get lost in Forlì. You can wander about aimlessly for as long as you like, and you will still find yourself on one of the main streets in the centre, be it Garibaldi, Delle Torri or Mazzini. 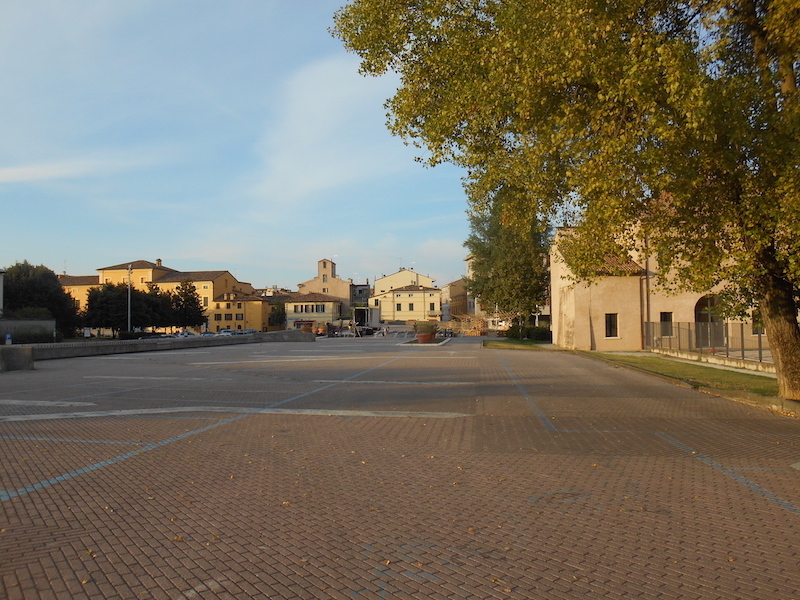 In fact, in the end all Forlì streets lead to Saffi Square. Fossato Vecchio Street is a case in point. Around halfway down Fossato Vecchio, turn right into Moscatelli St. and then, at the end, left into Matteucci St. A bit further on, you will find Cavour Square to the right and, starting just there, Orselli Street. In fact, the whole area (which is very broad, and framed by cafes and restaurants on the left, and the covered market on the right) is known as Giardini Orselli (Orselli Gardens), though technically that’s only the name of the gardens next to Delle Torri Street. And where does Delle Torri St. lead to, if not Saffi Square? A few steps and you’re there. 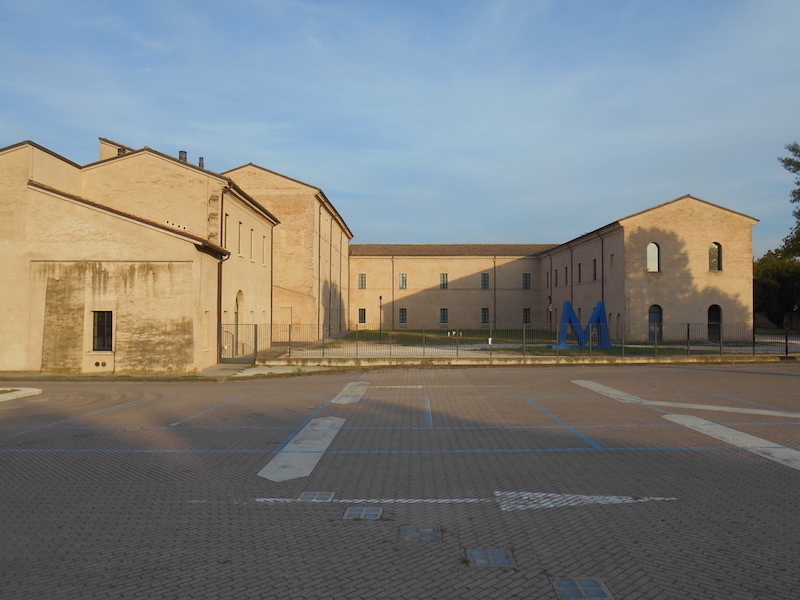 When it comes to architecture, Forlì is among Italy’s ‘most fascist’ cities. Several historic buildings around the centre were built in a characteristic Rationalist style, which clearly reminds of the ‘Ventennio’, the two decades of fascist rule in the country. The facades of buildings like the Casa del Mutilato in Maroncelli St. still display the fascist emblem, also visible on the lamp-posts in Saffi Square next to the ‘X anno’ (‘year ten’) note, a reminder of the fascist rule in the city. 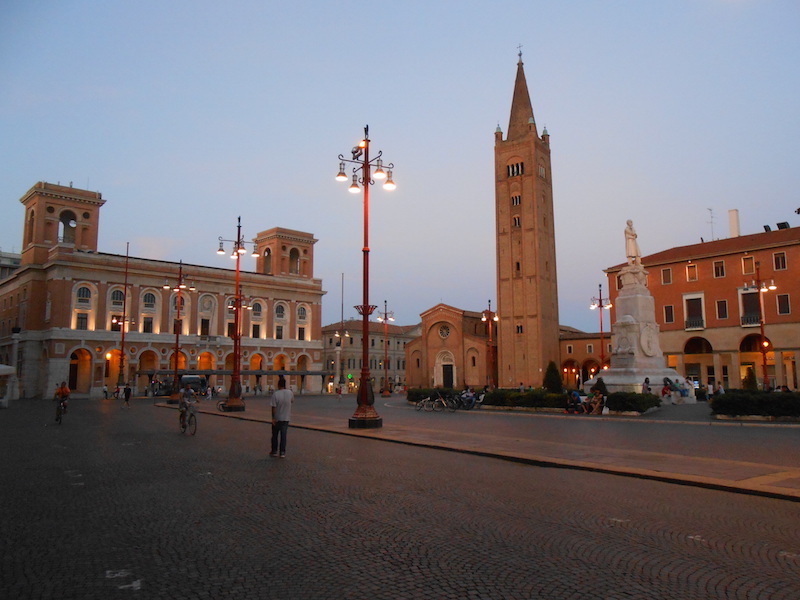 Historical references aside, Saffi Square is the conventional starting point and final stop of any Forlì tour. It also makes for a super handy meeting point, provided you agree in advance on which side of the square you will meet on. Saffi Square is very broad and bright, and the light is almost blinding if you cross the square on a summer day in the blazing sun. Tourists and first-time visitors usually find it enchanting. Dwellers don’t really see anything special about it. In such cases, climbing the steps to the top of San Mercuriale tower has the power to change even the most sceptical mind. 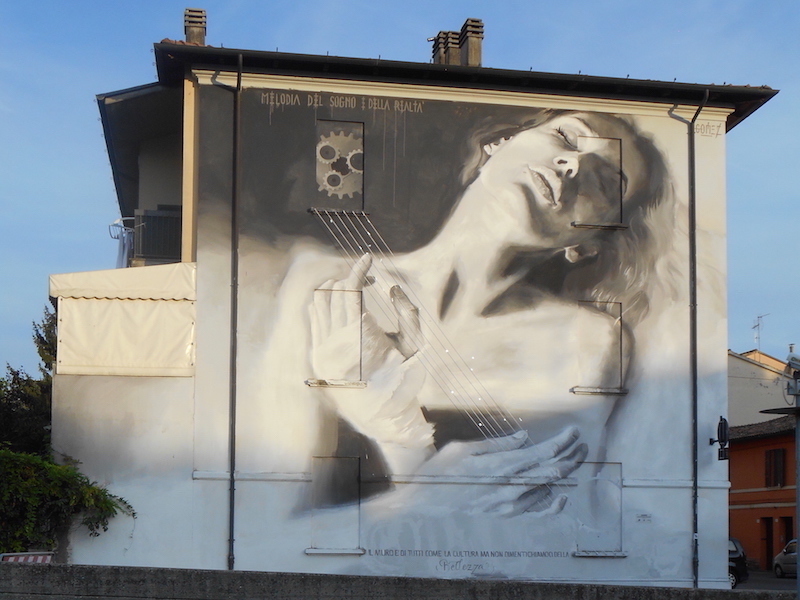 This entry was posted in Forlì 2016, Italy, NUOK Zone and tagged duomo, forlì, giardini orselli, gomez, nuok, old Forlì, rationalist architecture, saffi square, san domenico museums, urban safari by Giorgia. Bookmark the permalink.